If you’ve been holding out for the next great Android superphone, your time has come: The Galaxy Nexus has arrived on U.S. shores. We’re lucky enough to have one in the PCWorld offices, and so far the Galaxy Nexus looks to be worth the wait. We’ll be posting our full rated review of the Galaxy Nexus tomorrow morning, after we conduct performance tests in the PCWorld Labs. This Samsung-built phone goes on sale today online, and at Verizon and Best Buy stores, for $300 with a new two-year contract. The big deal about the Galaxy Nexus, of course, is that it is the first device to ship with Google’s latest version of the Android operating system, Ice Cream Sandwich (also known as ICS, as well as Android 4.0). Taking a cue from Apple products, the Galaxy Nexus comes in attractive, minimalist packaging. Other than an embossed Verizon logo, the white box is completely plain. 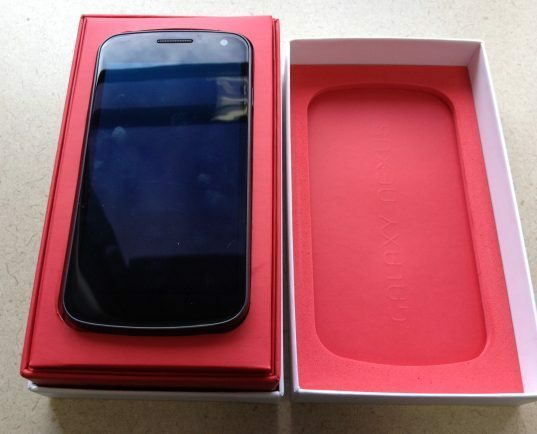 Opening the box reveals a red interior with a USB cable, a wall charger, headphones, and the Galaxy Nexus itself. The Galaxy Nexus is a long phone. When I picked up the Galaxy Nexus, my first thought was, "This looks like a Samsung phone, but it doesn’t feel like a Samsung phone." The glossy display, piano-black bezel, and textured back are all characteristic of Samsung design. But unlike other Galaxy phones I’ve reviewed, the Galaxy Nexus feels high quality. At 5.1 ounces, it has a nice substantial weight to it without being too heavy. 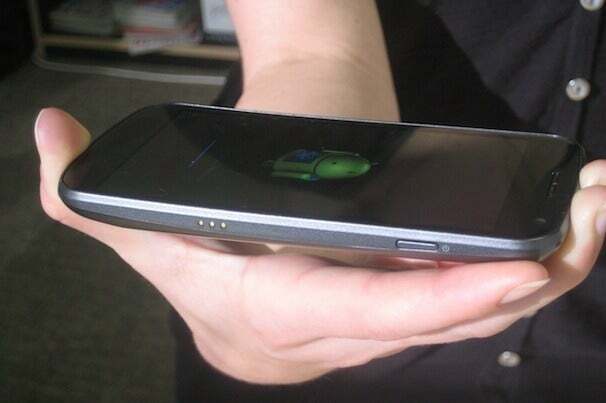 As you can see from the photos, the Galaxy Nexus has a subtle curve, which nicely contours to the hand. If you have small hands like me, however, you might find the Galaxy Nexus a bit large (it measures 5.33 by 2.67 by 0.37 inches). 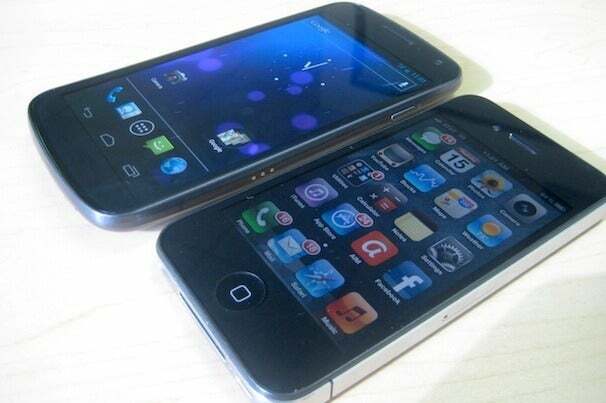 The Galaxy Nexus, side by side with the iPhone 4S. The display is a roomy 4.65 inches, but really only 4 inches of that real estate is usable. The remaining 0.65-inch space is occupied by a customizable shortcut bar that appears at the bottom of the home screens as well as some other internal screens. Even so, the screen feels plenty spacious for all of your gaming, video, and other multimedia desires. The Galaxy Nexus sports an HD Super AMOLED display. Colors pop from the display and blacks look deep, while fonts and details appear sharp. My only complaint is that whites aren’t as bright as they could be. One of my colleagues remarked that the screen had a slight yellowish tint. Still, I was pleased overall with the quality of the display. Ice Cream Sandwich is everything I’ve wanted Android to be: intuitive and attractive, while maintaining a high level of customization and performance. Ice Cream Sandwich truly has mass appeal. Icons are sharper, menus are easier to navigate, and performing basic tasks is more efficient than in previous versions. If you’re familiar with Android Honeycomb on tablets, you’ll find a few familiar features in Ice Cream Sandwich. As in Honeycomb, widgets in Ice Cream Sandwich are now resizable on the home screen. You'll also find a dedicated on-screen Recent Apps button for seeing all of your open apps; just as on Android tablets, it displays a scrollable list of running apps with thumbnail images. Flicking through and switching between apps is not as speedy as I would like it to be, however--I encountered a noticeable delay when going from one app to another. 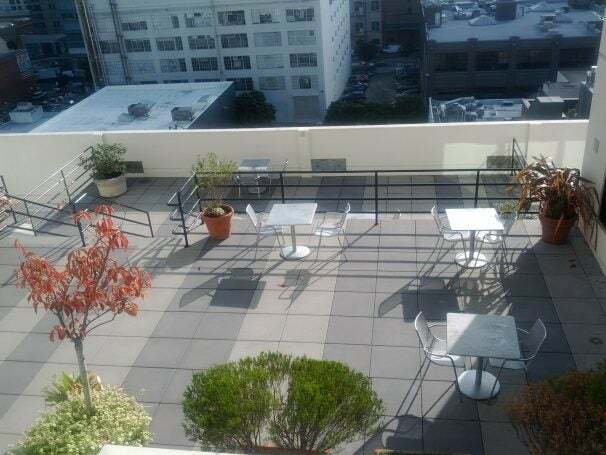 The photos I shot with the Galaxy Nexus’s 5-megapixel camera looked a bit flat. Colors seemed a bit washed out, and details were a little fuzzy. 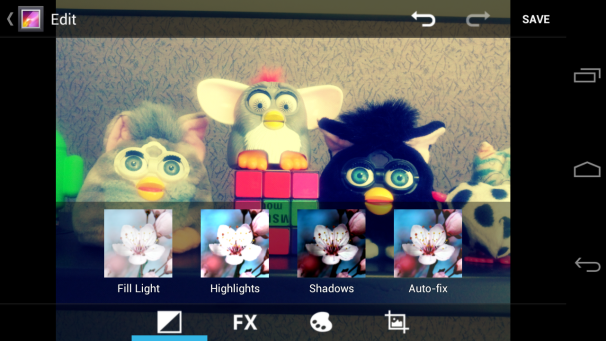 But even if your photos don’t come out perfect, Ice Cream Sandwich has your back with its suite of photo-editing tools. You get an array of filters (like your very own Hipstamatic app), the capability to adjust the image angle, red-eye removal, cropping capabilities, and more. You can make your photos look as if you took them with a very old camera. The PCWorld Labs is still running benchmark tests on the Galaxy Nexus; but in my hands-on use, I was impressed with the snappy dual-core 1.2GHz TI OMAP 4460 processor. Apps launched promptly, and videos ran perfectly. As I mentioned before, multitasking takes a bit longer than expected. Scrolling through Web pages and menus, too, isn’t as fluid as I would like. Verizon’s 4G LTE network, of course, plays a huge role in the speediness of the Galaxy Nexus. In my tests using the FCC-approved Ookla Speedtest app, the Galaxy Nexus achieved download speeds ranging from 6.69 to 12.11 megabits per second and upload speeds of 21.18 mbps. In other words, the Galaxy Nexus is blazingly fast. Battery life is a big concern for the Galaxy Nexus, since Verizon LTE phones don’t exactly have the best track record when it comes to conserving battery power. We’ll be testing this in the next few days. Stay tuned for our full rated review of the Galaxy Nexus for Verizon, as well as further coverage of Android Ice Cream Sandwich.